The 1803 Louisiana Purchase doubled the size of the young American republic, just 20 years after it won independence from Great Britain. Native American territory decreased as colonists moved westward. In the middle of the century, the concept of Manifest Destiny provided justification for further territorial expansion, and encouraged pioneers to “spread civilization” across the entire continent. However, the slavery issue divided the nation. In the second half of the 16th century, England resolutely turned its attention to the West. It concentrated on the colonization of Ireland and launched several initiatives in North America.The first of these initiatives involved 6 maritime expeditions in search of the North-West Passage, which would make it possible to sail around the American continent to the North and facilitate trade with China’s wealth. During the 17th century, the English claimed the whole central area of the North American coast and named it ‘Virginia’. In 1606, King James I issued a Colonization Charter for two limited liability companies: the London Company and the Plymouth Company. In the decades that followed the establishment of the colony of Virginia, England sent settlers to sites all along the American coast between New France, to the North, and Spanish-controlled Florida, to the South. The first settlers were mostly people who left Europe because of religious discrimination. Following the first Treaty of Paris signed in 1763, the entire territory between the Atlantic Ocean and the Mississippi came under British rule. With the second Treaty of Paris in 1783, the United Kingdom recognized the 13 colonies as ‘free and sovereign states’ and handed over all its territories east of the Mississippi. The Declaration of Independence was signed on July 4, 1776, thus breaking all ties between the 13 colonies and Great Britain. The first conflicts involving British troops and American militiamen had taken place a year earlier in the Boston area. Considering its desire for new territories to conquer and its need to defend its territory against attacks from other countries, the new American state quickly sought to extend its borders. Two Ordinances signed in 1787 and 1789 established rules covering the admission of new States to the Union. Following the Louisiana Purchase in 1803, President Jefferson sent Lewis, his personal secretary, and Captain Clark on a scientific, political and commercial mission of exploration westwards to the Pacific Ocean. Oregon’s rich natural resources, and in particular the opportunities it offered for the fur trade created lively competition between Canadians from the Hudson Bay Company and American settlers over control of the territory. 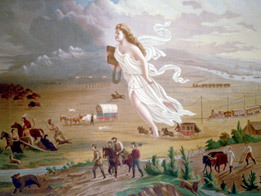 To fulfill the concept of Manifest Destiny, which encouraged the expansion of US territory to the Pacific Ocean, several transcontinental trails enabled settlers to move westward from the Missouri. Pressure from settlers gradually reduced the territories where the Native Americans lived. In 1830, the Indian Removal Act authorized the removal of native tribes to reservations West of the Mississippi River. Following independence, Mexico opened up a part of its territory to settlers. American and European pioneers moved to Texas and set up ranches where they grew cotton and raised cattle. The Union’s victory over the Confederates brought an end to four years of Civil War, but resulted a period of intense controversy on how to re-establish the unity of the nation. Following strong controversy over where the railroad should be built, the Pacific Railroad Act of 1862 awarded contracts for a first track between Omaha and Sacramento to two railroad companies: the Union Pacific and the Central Pacific. During the first half of the 19th century, a growing number of immigrants in search of liberty and a better economic future arrived in the United States, mainly from Northern Europe. Native American tribes roamed the Great Plains of the Midwest in the wake of migrating herds of bison, which were their main source of wealth. Once the Civil War was over and the nation was reunited, the desire for conquest re-emerged and the United States began to look beyond its frontiers for new opportunities.